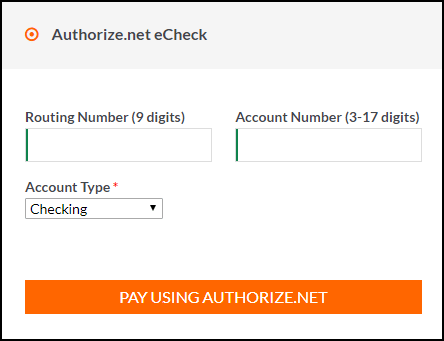 Using our ELEX Authorize.net Payment Gateway for WooCommerce plugin (Previously known as XAdapter Authorize.net plugin), you can easily integrate Authorize.net Payment Gateway, and accept credit cards & eCheck payments from your customers. The best part is, it keeps your customers on your site during the entire checkout process (unlike the default WooCommerce PayPal Standard payment option, which redirects customers to PayPal site during checkout). 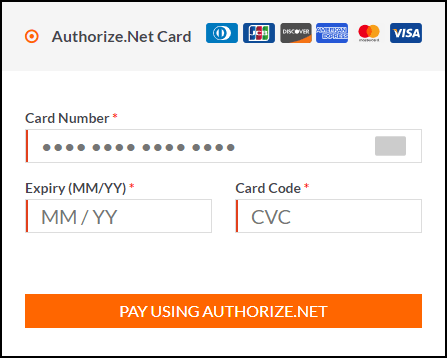 Authorize.net offers easy, safe, and affordable credit card processing. Our ELEX Authorize.net Payment Gateway for WooCommerce plugin lets you take advantage of Authorize.net for payment processing while providing merchant tools like refunds and captures from within your WooCommerce dashboard. This plugin allows you to keep the customer on your site for the entire checkout process. This gives you maximum control over checkout, so that you can test and implement the most effective user experience for your store. As this is a direct checkout process, it is recommended to get an SSL certificate for PCI compliance to ensure the security of your customers’ credit card information. The plugin uses the AIM (Advanced Integration Module) API from Authorize.Net®. The plugin accepts major cards like MasterCard, Visa, American Express, Discover, JCB and Diners Club. The logo of the selected cards will be displayed on your WooCommerce Checkout page. In addition to card payments, the plugin allows you to accept eCheck payments from customers having Checking, Business Checking or Savings account. 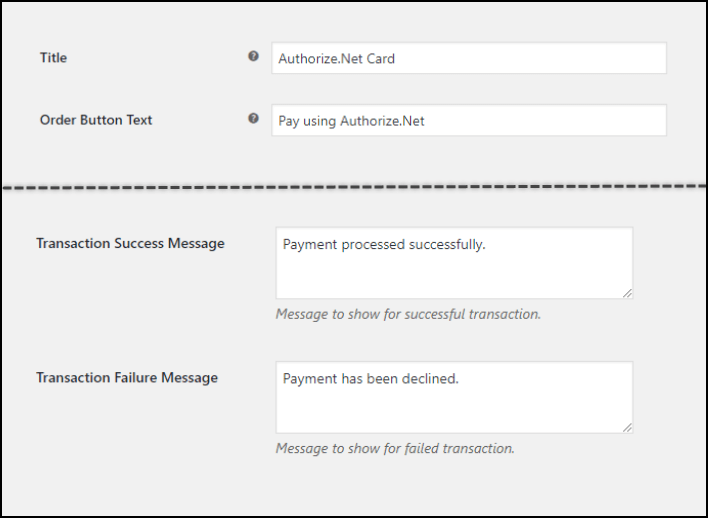 A consolidated overview of Authorize.Net payments, that allows you to capture payments and process refunds in a single click. 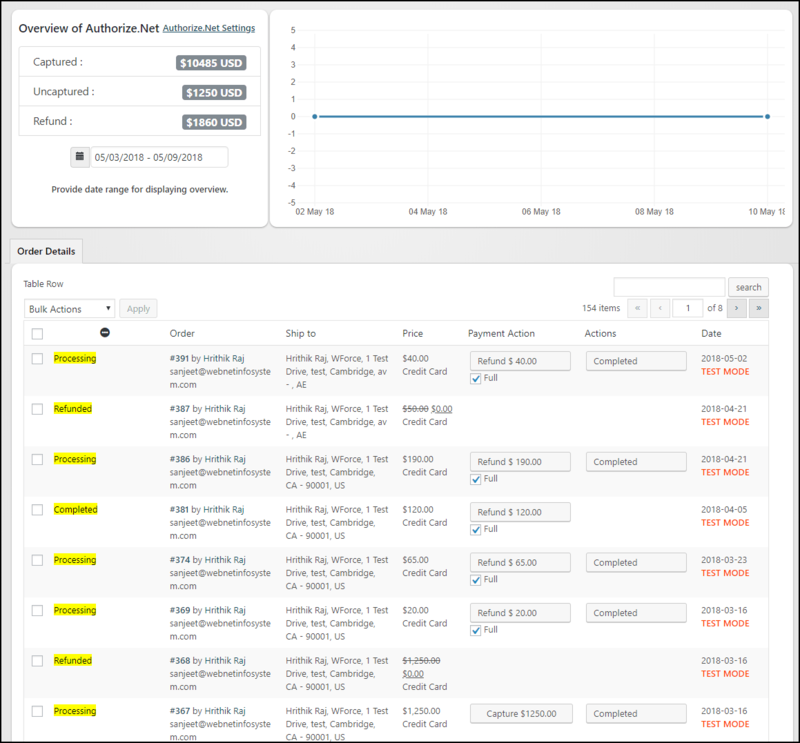 Process partial or full refunds from WooCommerce admin order page as well as Authorize.net Overview page. The plugin allows you to either only authorize the payment, or authorize & capture the payment concurrently. With this feature, you can redirect your customers to the desired page(like a thank you page) once the Checkout is successful. The plugin lets you easily accept payments for WooCommerce Subscription products. The plugin provides easy customization for defining custom text for the payment method title, order button text, and custom transaction messages. This customization helps smooth your customers’ checkout experience. Nice plugin, works as expected and the team was nice enough to help me fix a very minor issue I had. Great service and support, very happy, thank you! Great plugin! I needed help with a customization and they were super responsive and great to work with! A must for any site needed Auth.net! Purchased three plugins, fedex, woocommerce CSV integrations/export. and Authorize.net plugin = Excellent customer support. They have excellent support and everything works with my website: http://www.K12Print.com. 5 Stars!!!!! Outstanding support. We requested them an specific feature and they implemented. This team is highly recommended!Angel. What are the countries supported by Authorize.net? The following countries are supported by Authorize.net payment gateway: United States, United Kingdom, Europe, Australia, and Canada. Can we save card information for the old customers? Yes, we have included the CIM feature. You can enable the save card information option in the plugin settings. Can I Refund using this plugin? Yes, if the payment was done using this Authorize.net plugin, you can refund the amount. Is this plugin compatible with WooCommerce Subscription Plugin? Does the plugin work with TLS 1.1? Authorize.net has upgraded its Transport Layer Security specification for it’s APIs to TLS 1.2. This enables increased security to Authorize.net transactions. Our plugin is using updated Authorize.net APIs and so, require TLS 1.2. If your server is using TLS 1.1, it must be updated to TLS 1.2. Good technical support. Highly recommended. Outstanding support. We requested them an specific feature and they implemented. This team is highly recommended!